... the fact that Tim's fat was a direct result of Leo leaving him on the front line was not lost on my 5yo. He got it on a very basic level, but I wouldn't be surprised if Leo had trouble putting others in danger in the future after getting a taste of the burden of command. Heavy stuff under the surface makes for some fine toonage worthy of the Turtles comic heritage. Helps that they kept just the right amount of wacky too. Finally, someone responded to the last episode! Anyone thinking the Pulverizer will get turned into Mutagen Man? There's a super short clip w/ a few lines of Krang Prime voiced by...you would never guess. Roseanne Barr. onions wrote: kids will think it's a goofy cartoon with weird looking monsters. but for adults if you look deep enough, and you don't have to make any huge stretches of imagination, there is a surprising amount of depth. That's becoming more and more of a trend in cartoons, Adventure Time and Transformers Prime being my favorite examples. Anyone else realize Raphael is voiced by Samwise Gamgee? Right away. What caught me off guard was that the voice of Donatello did Raphael in the old cartoon. is one of my favorite movies of all time, i enjoyed this episode way more than i thought I would. Hehe, did anybody else catch the Teenage Mutant Ninja Turtles 2 reference in "Follow the Leader"? 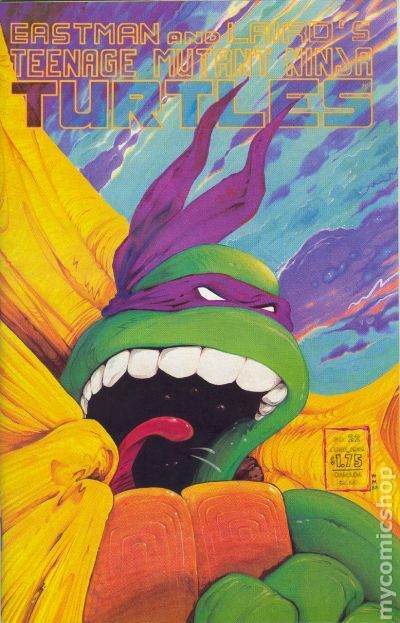 Also, Mikey using "ninja" instead of the N-word, while a pretty old pun, was pretty funny. The foot soldier androids were pretty awesome too! Finally some competent goons in this show!